At the fdt Africa 2018 expo recently, a standout product for this editor was the first public showing in SA of CO2Sustain, a new anti-foaming processing aid that creates impressive improvements in carbonated beverage production efficiencies and end-use consumer enjoyment. So what is CO2Sustain? It’s a pasteurised, ultra fine, dispersion of polysorbate 65 in water – a new, non-silicone route to clever carbonation. Used at very low concentrations, it reduces costs by controlling foam during the filling process, while also increasing the perception of fizziness in the finished poured beverage. 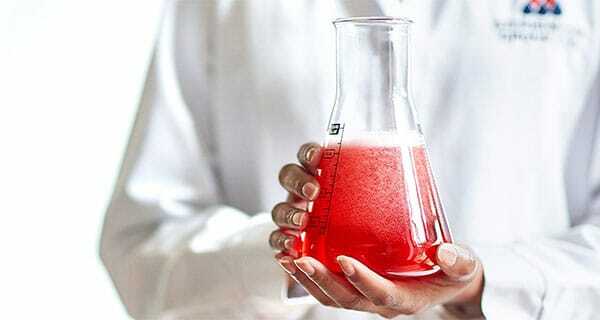 It was invented and patented by the UK’s Stephenson Group, a chemicals developer and vendor. As I sipped the best-tasting, fizziest Coke Light I’d ever tasted, Sustain’s technical director, John Story, explained, well, the story: “It began when we were contacted by a large global soft drinks brand who needed help to eliminate excess foaming during their soft drink filling process. 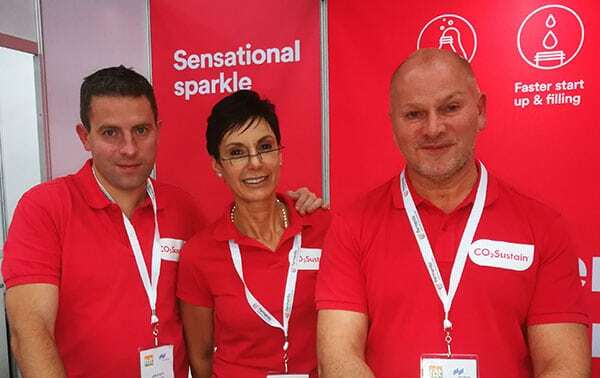 The CO2Sustain team at fdt Africa expo: Jonathan Stott (business manager), Vanessa Krügel (SA agent) and John Story (technical director). “They were looking for a non-silicone alternative to the commodity silicone-based ‘antifoams’ they were currently using. A google search had led them to our website where they could see we were producing food-grade, silicone-free antifoaming agents for washing potatoes. After months of testing dozens of food and beverage grade additives, the company’s smart chemists ascertained that no traditional ‘surface active’ antifoam could address the known industry-wide fobbing problem – the foaming of beer/csds during processing or dispense. “Instead, we focused on eliminating foam generation in the first place — through manipulating the bubbles in the bulk of the liquid, rather than at the surface — focusing on getting more CO2 into the drink from the start,” explained Story. CO2Sustain’s unique formulation controls the excess foam by discouraging bubbles from merging into larger bubbles. This reduces costs by controlling foam in the filling process whilst maintaining the “fizziness” of the drink. With CO2Sustain, because the bubbles are smaller, the poured beverage will be perceived as tasting fizzier, so there is the option of reducing the CO2 level during the filling process without adversely affecting the consumer experience. It is added directly to the concentrated syrup without the need for heating, with minimal stirring. It’s easy to calculate optimum dosage, making the process of switching to CO2 Sustain quick and simple. As the dosage is a tiny 0,10g/litre, there are minimal cost implications. By controlling the foam during filling, CO2Sustain can reduce operational costs. “Adding CO2Sustain allows quicker start up time, faster speeds at higher temperatures of up to 18 degrees C, and lower CO2 levels with less rejects,” said Story. Story believes their product is particularly relevant in the era of sugar reduction. “As reduced sugar content is becoming more and more important to CSD customers, CO2Sustain assists brands in producing drink ranges with sugar substitutes, which would usually cause the drink to foam more in the bottling process. “This allows line speeds to remain fast while ensuring customers are happy!” asserts Story.